– Many of the uses of black cohosh are associated with the female cycle. For women experiencing the symptoms of menopause, black cohosh uses include: relief of headaches, sleep problems, hot flashes, heart palpitations, night sweats and vaginal dryness. 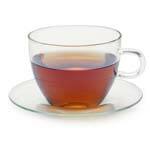 Black cohosh tea also appears to aid in balancing mood swings. It is easy to see how all of these benefits could also bring relief to pregnant women, who often suffer from many of the same symptoms. – Many women claim to have successfully used black cohosh to induce labor. Of course, it is highly recommended that you consult with your obstetrician before attempting this. – Black cohosh side effects generally include headaches and upset stomach. These side effects often occur only at high dosages of black cohosh and it is advisable to see your doctor before taking black cohosh. If you are pregnant, menopausal or suffering from symptoms of PMS, it is worth it to see if black cohosh tea is right for you. As always, consult your physician first to make sure your black cohosh regime will not interfere with any of your existing medications and/or supplements.